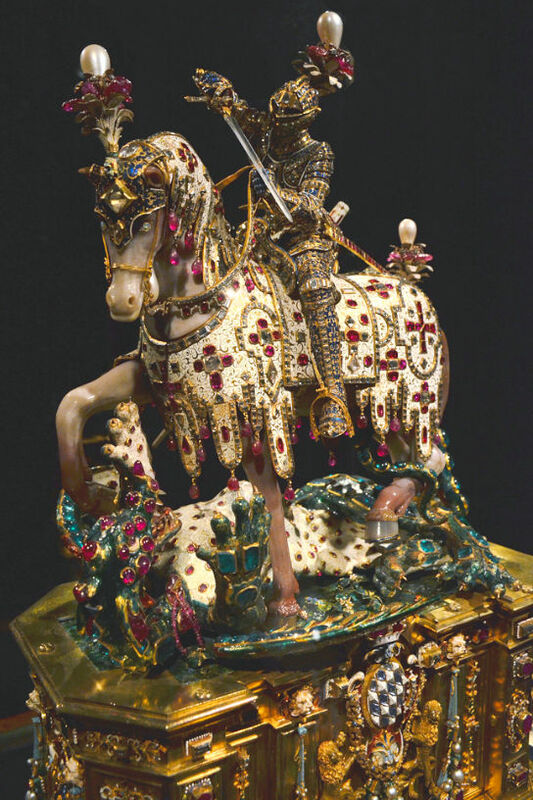 St. George and the Dragon statuette was commissioned by Duke Wilhelm V, who reigned between 1579 and 1597. It appears to have been designed and executed by the native Hans Schleich together with the Duke’s Chamber Gold­smith Hans Schwanenburg from Utrecht, aided by a veritable corps of spe­cialists. Duke Wilhelm’s son, Maximilian I (1597-1651), had the original eb­ony base replaced with the present sumptuous pedestal. An inventory made in 1745 speaks of 2,291 diamonds, 406 rubies, and 209 pearls. In 1612, the statu­ette was valued at 300,000 florins, a colossal sum in those days. Early in the sixteenth century, the rulers of Bavaria had become enamored of Italian art and architecture. 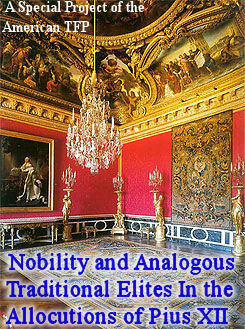 They also had unlimited opportunity to obtain the most precious materials to work with: gold from the New World, rubies and pearls from the Far East, ebony from tropical Africa and Asia, onyx from Saxony, South America and Hindustan, lapis lazuli from Russia and Afghanistan, and lastly, emeralds and rock crystal from Africa, India, South America, Russia and Japan. The tiny statuette is barely twenty inches high from its base to the pearl, which looks like a white plume on the knight’s helmet, and the statue is only slightly over thirteen inches from stem to stern and less than eight in depth. Much of the work is in enameled gold: a thin, transparent coat of melted glass which has been colored by the addition of metallic oxides is spread over pure gold, then incised in delicate patterns to permit the bold base to gleam through, and finally fused by firing. The knight’s armor is blue enamel into which has been cut a tendril design to expose the underlying gold. Then, the artist-craftsman, with an imagination of pure genius, studded the armor with innumerable closely set tiny diamonds to make it seem even more metallic. The spurs and stirrups are gold, the girdle, dag­ger, and sword are set with rubies, and the sword blade slashing downwards is made of purest rock crystal. 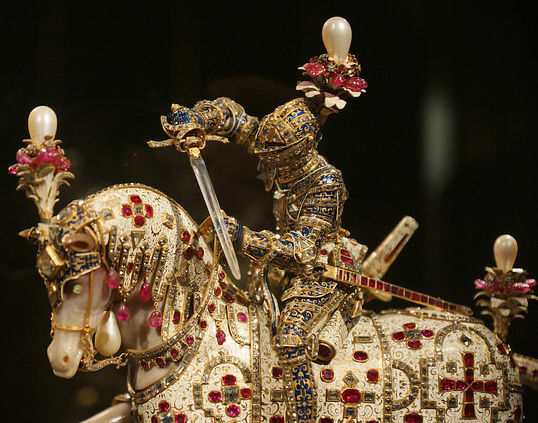 The plume, like those on the horse’s head and croup, is a large pear-shaped pearl mounted in a cluster of rubies and diamonds, which bloom like some strange flower on a metallic cactus. The heroic steed is fashioned from agate, his hoofs from chalcedony, and a pearl drops like a dewlap from his neck. But gold there is, and gems too: the caparison in white enameled gold is covered with bands of tiny diamonds and rubies, and from its scalloped borders rubies drip like tufts of fringe. Close up of St. George. Photo taken by Allie_Caulfield. On a patch of green-enameled ground strewn with jeweled flowers writhes the dragon in chased gold with engraved scales, its back in the most vivid green enamel set with emeralds and rubies, its underbelly in white enamel pockmarked with rubies. It has died, or is dying, in luxury, pierced with a rock crystal lance. Close up of the Dragon. Photo taken by Allie Caulfield. 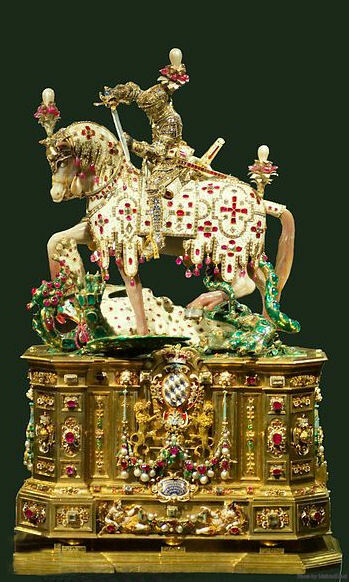 Well concealed by this lavish decoration is a tiny drawer containing a reliquary of St. George jeweled as elaborately as all the rest. 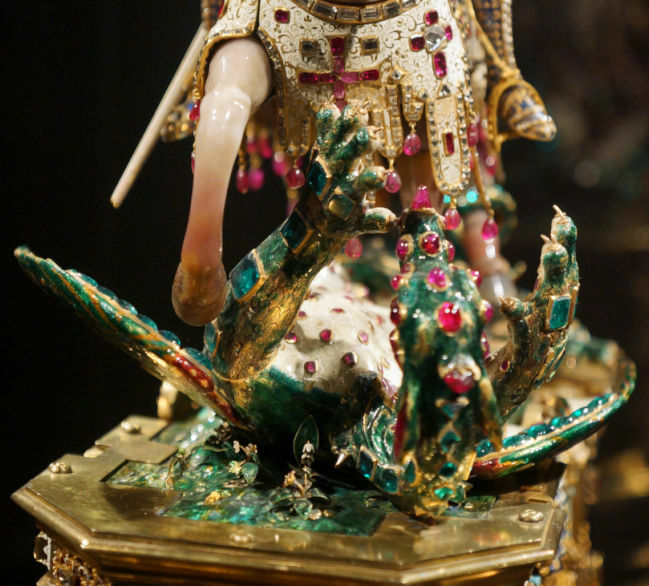 This statue is housed in the Residenz Museum in Munich, Germany.